As we note that the history of science is, effectively, the history of the instruments developed to help us “see” things smaller, larger, smaller, farther, or outside our human sensory range, we might recall that it was on this date in 1664 that natural philosopher, architect and pioneer of the Scientific Revolution Robert Hooke showed an advance copy of his book Micrographia— a chronicle of Hooke’s observations through various lens– to members of the Royal Society. The volume (which coined the word “cell” in a biological context) went on to become the first scientific best-seller, and inspired broad interest in the new science of microscopy. 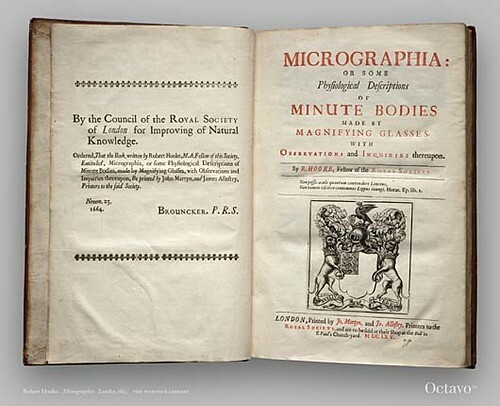 Note that the image above is of an edition of Micrographia dated 1665. Indeed, while (per the above) the text was previewed to the Royal Society in 1664 (to wit the letter, verso), the book wasn’t published until September, 1665. Note too that Micrographia is in English (while most scientific books of that time were still in Latin)– a fact that no doubt contributed to its best-seller status.